Adam Carolla (@adamcarolla) is a best-selling author, comedian, actor, and host of The Adam Carolla Show — the Guinness World Record holder for Most Downloaded Podcast. How Adam came up in comedy and resisted negative influences. Why trading time for money is a losing proposition and how we can break the cycle. Sometimes you don’t need a grand plan to break away from a medieval laborer’s mindset — just the motivation to do something more with your life. How to tell if we’re doing something for ourselves or doing something based on pressure from others. Why it’s important to run toward your fear. How does a construction worker without much of a plan escape the blue collar hourly wage mindset to become a comedian, best-selling author, actor, and host of the Guinness World Record Holder for Most Downloaded Podcast? 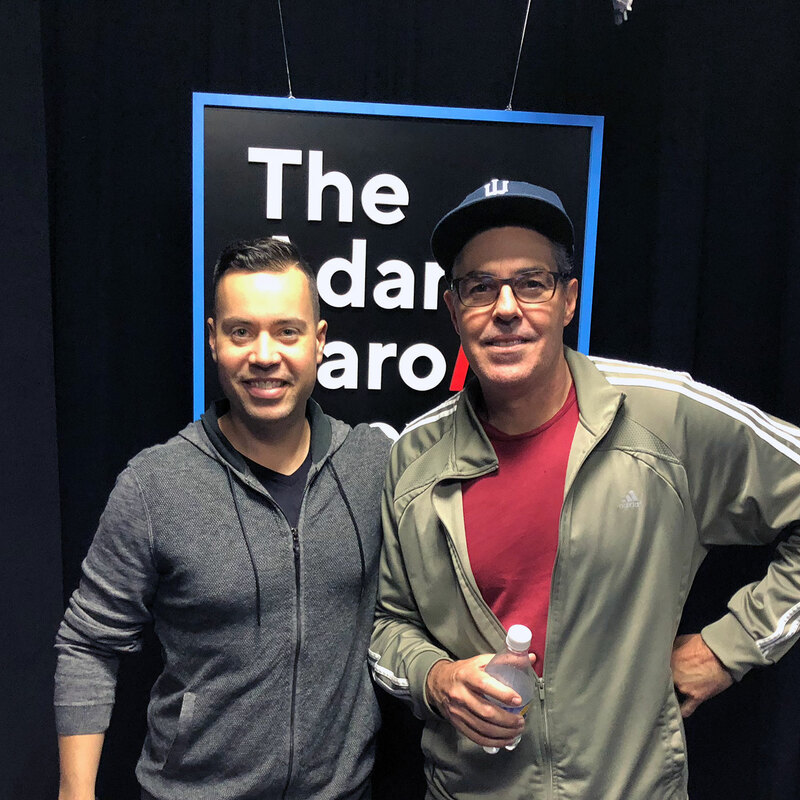 Adam Carolla of The Adam Carolla Show joins us to share his story and explain why trading money for time is an uneven exchange, what we have to gain by running toward our fears, and how Adam was convinced to compete on Dancing with the Stars. Listen, learn, and enjoy! Hate grocery shopping but you love to cook? Blue Apron delivers recipes and farm fresh ingredients to you. As a Jordan Harbinger Show listener, you get your first three meals free at blueapron.com/jordan! Growing up in a family that didn’t offer much in the way of mentorship, The Adam Carolla Show’s namesake didn’t aim particularly high when he started dabbling in show business. But he still found it important to take improv classes at The Groundlings in spite of the flak he got from his earthquake rehabbing construction friends — who didn’t understand why he would pay someone else to let him make up stuff on a stage. As it became clear that toiling his life away on construction sites for minimal reward with zero vacation time, sick days, or medical insurance was a sucker’s game, Adam looked for alternatives. No matter what job Adam got, the discussion among his coworkers always centered around how to make more money per hour. But Adam’s calculations saw this as a losing game no matter how much could be made on an hourly basis. “Even if you’re getting $100 an hour,” says Adam, “if it was still based on you having to come in, having to be up on the roof or carry the drywall or dig ditches or whatever it is, and then you got sick — got the flu and couldn’t come in for two days — you got nothing. It’s still kind of flawed. Even at that princely sum. While Adam says he never really planned on chasing success, he was motivated by knowing whatever qualified someone to live a “normal” life wasn’t something he was going to find trading away his time by the hour. There had to be something more. Adam didn’t have a grand plan beyond thinking it would be nice to have a job where he’d get paid for his ideas instead of breaking his body slowly day by day — and maybe being inside a room with air conditioning would be a nice bonus. He was sick of subscribing to the blue collar mentality of trading physical labor for the things he wanted in life — which is ingrained in a lot of people from an early age. It’s a mentality that easily becomes a lifestyle as it gets cemented into someone as the quickest, straightest path to making money — and as time goes on, a person who settles for living such a lifestyle may even forget that there are many other ways to make money in the world. So comedy was the obvious next step for Adam. Listen to this episode in its entirety to learn about Adam’s sports ambitions that didn’t quite pan out, what translated from Adam’s construction experience into building a comedy career, the kinds of jobs sketch comedians could expect to get when Adam was starting out (and why they were still closer to the dream than construction), how Adam got involved with radio and eventually podcasting, why Adam is attracted to chasing uncertain outcomes, why Adam remembers exactly where he was when his agent asked him to do Dancing with the Stars, and lots more. Click here to thank Adam Carolla at Twitter!